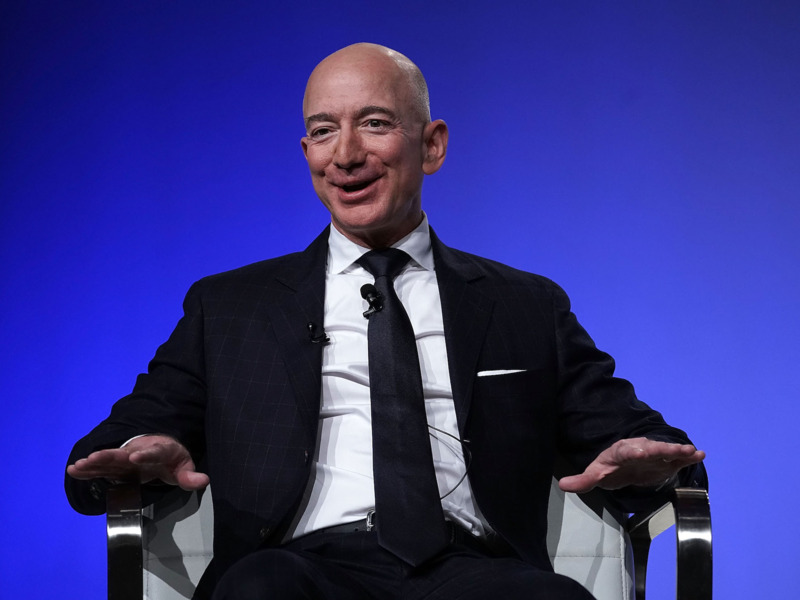 Alex Wong/Getty ImagesJeff Bezos on Tuesday announced plans to raise Amazon’s minimum wage to $US15 an hour. Amazon on Tuesday announced plans to raise the company’s minimum wage in the US to $US15 – more than twice the federal minimum wage of $US7.25. The minimum-wage increase is pennies, however, compared with the amount Bezos makes each hour, based on our calculations: $US4,474,885. At that amount, it takes Bezos 12 milliseconds to earn $US15. And while the new minimum wage is more than twice the federal minimum wage of $US7.25, the new total is nowhere near what Bezos makes an hour. 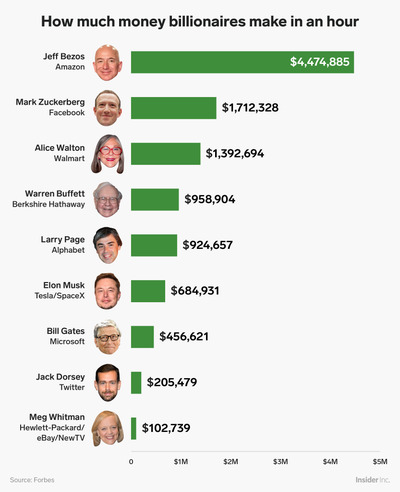 From 2017 to 2018, Bezos made $US4,474,885 an hour. Shayanne Gal/Business InsiderBezos makes more than $US4 million an hour. An Amazon worker earning the $US15 minimum wage would need to work about 298,325 hours, or 24 hours a day for about 34 years, just to earn what Bezos makes in one hour. So how long does it take Bezos to earn $US15? 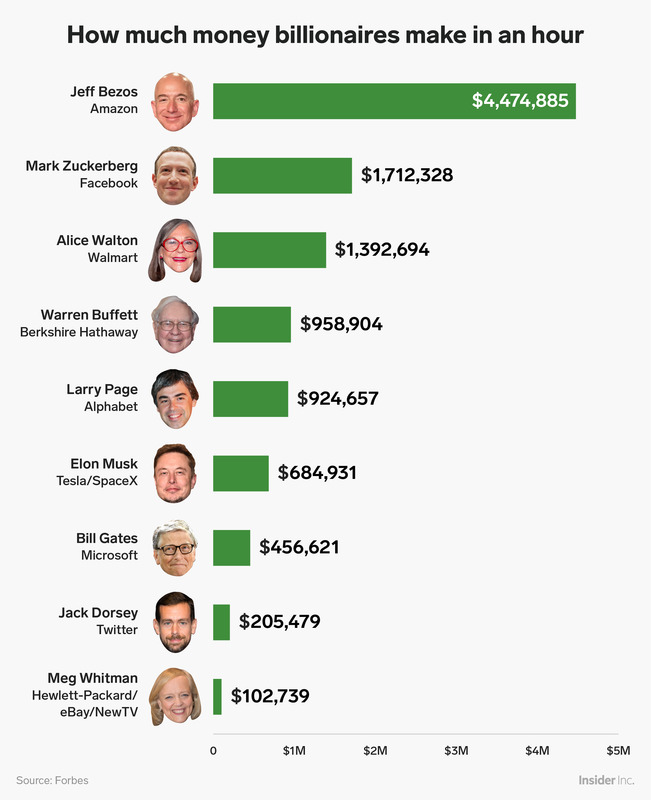 At the rate Business Insider calculated, he has earned $US74,581 a minute and $US1,243 a second. To earn $US15, that’s about .012 seconds, or 12 milliseconds – a little less than a third of the length of a single standard movie frame. In the past year, Bezos earned an estimated $US39.2 billion, compared with the $US28,466 median annual worker pay at Amazon.